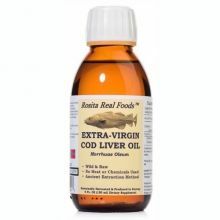 Totally unrefined, unprocessed, never heated and never exposed to chemicals, Rosita Extra Virgin Cod Liver Oil is a powerful and genuine RAW Superfood, loaded with naturally occurring biologically active nutrients, including Vitamins A & D, and a complete range of RAW Essential Fatty Acids 3, 4, 6, 7, 9 and 11. 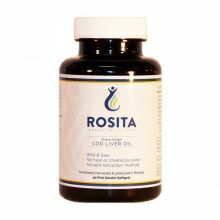 Especially Rich in long-chain omega-3s (EPA and DHA), which must be obtained from food, Rosita Cod Liver Oil contains all the nutrients naturally present in the liver of a living codfish – nothing more and nothing less! Rosita Extra Virgin Cod Liver Oil SoftGels DO NOT require refrigeration. Serving Size 3 SoftGels, 30 Servings per Bottle.